Preheat oven to 450°F. Lightly coat a baking sheet with cooking spray. Cut each potato crosswise into 8 round slices. Place slices on baking sheet. Bake for 25 to 30 minutes or until lightly browned. Mix together the ground sirloin and thyme in a mixing bowl. Form into 8 balls. Fold each slice of cheese in half 4 times, forming a cube. Press cheese cube in between 2 ground sirloin balls, sealing cheese inside. Form into a patty by flattening to approximately 1 1/2-inch thick. Repeat for 3 more patties. Lightly coat a deep skillet with cooking spray. Heat skillet over medium-high heat. Add stuffed patties and cook for 3 minutes on each side. Add water; cover and cook for 6 minutes. 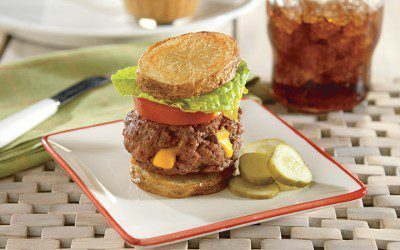 Place each burger on a slice of potato. Top with tomato slice, lettuce leaf and another slice of potato. Exchanges per serving: 2 Bread/Starch, 2 Meat.